· Use reusable bags: Paper bags kill trees, and plastic bags end up in a landfill, the water or on the beach where it takes anywhere from 20 years to 1,000 years to decompose. · Turn down the temperature: Take a warm shower instead of a hot shower. You will save hundreds in electricity, it’s better for your skin and you still get just as clean. · Be a “Thrift” Shopper: Purchase items from thrift shops, and drop off items you no longer use. · Drive less: Walk or bike as a great way to get exercise, or carpool to work. · Avoid plastics water bottles: Reusable bottles reduce greenhouse gases, improves the environment and saves wildlife. Going green is a win-win for you and our planet. Following these tips not only saves you money but also helps preserve the environment. 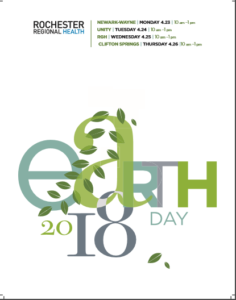 Click here to view the Earth Day Celebration Schedule. Posted April 5, 2018 under _Featured Stories List, News.